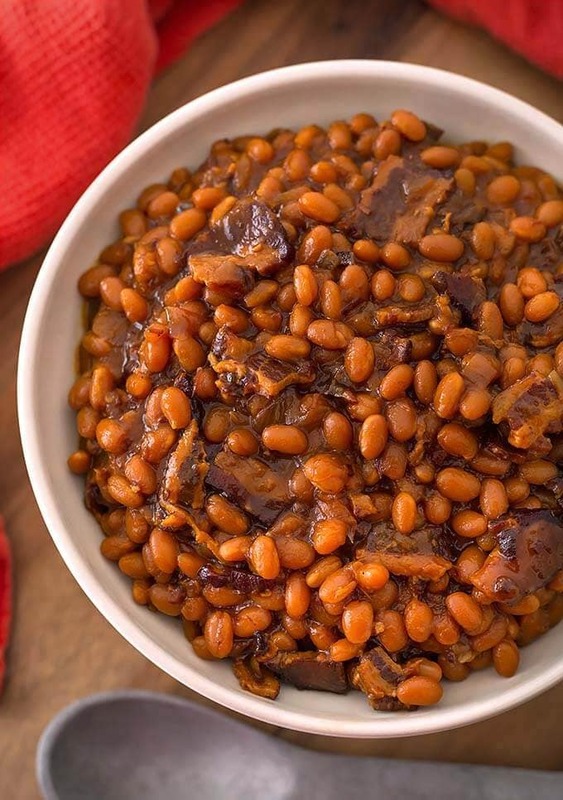 You don’t need to have a picnic to enjoy these rich, delicious Instant Pot Smoky Sweet Baked Beans! Pressure cooker baked beans cook faster than on the stove, and taste so good! Back in 1987 my family started having an annual 4th of July picnic at a beautiful park on the Puget Sound. Grandpa always brought the watermelon, my mom made her famous fried chicken, and I was asked to make my baked beans. The family loved them! So, they asked me to make them for Thanksgiving. Really? Okay! And so it went. I kept tinkering with my recipe until I got it how I wanted it. I was now expected to bring them to every family gathering, even Christmas! Making those beans takes a lot of time, so I would get up early to make sure I had enough time to cook them for the 2-3 hours they needed to become tender and delicious! The old stove top pressure cooker we had was too small, so I baked them in a turkey roaster in the oven. Our family isn’t as large as it was back then, so I don’t need to make the same amount of baked beans these days. 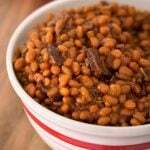 I decided to adapt my recipe to make Instant Pot Smoky Sweet Baked Beans, and was very happy with the results. Beans are wonderful made in the pressure cooker! I prefer to soak the navy beans for this recipe overnight. You can make it from Quick Soaked navy beans, though the prep time will be longer. (cook times will vary based on the age of your beans, and the type of bean you use). 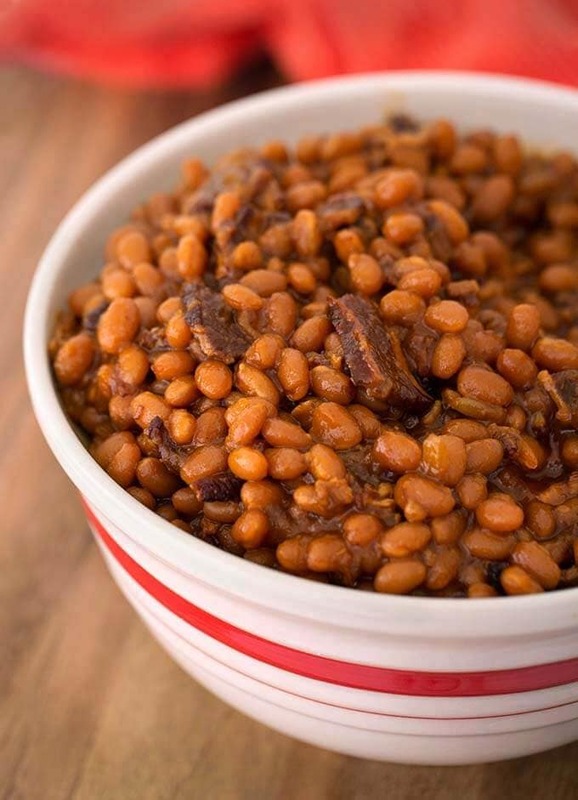 Instant Pot Smoky Sweet Baked Beans are rich and delicious. Made from soaked or dry beans in your electric pressure cooker. Soak beans in a bowl with 7 cups of water overnight. Then drain and rinse them. Set aside (You can also make this recipe from Quick Soaked beans. See Note. Sort, rinse, & set aside). Turn the pot on to the Sauté function. Add the bacon. Cook until mostly done. Add onions to the bacon and cook, stirring occasionally, until onion starts turning translucent. Add the garlic and cook for 1 minute, or until fragrant, stirring frequently. Add salt, pepper, water, syrup, ketchup, molasses, BBQ sauce, mustard, vinegar, liquid smoke, and stir well. Bring to a simmer and scrape the bottom of the pot to get up any browned bits (deglaze). Add beans and brown sugar. Stir, and place the lid on the pot and lock in place. Set the steam release knob to the Sealing position. Set to Pressure Cook (Manual) and use the + or - button (or dial) to select 40 minutes. Let the pot naturally release the pressure for 15 minutes after cooking cycle ends. Then manually release the remaining pressure. When the pin in the lid drops down, open the lid and give the beans a stir. Sample a few of the beans to check for tenderness. If they are too firm, place the lid back on and set the time for them to cook another 10 minutes, and a 15 minute natural release. When they are done cooking, if they are too soupy for your taste, turn on the Sauté function and stir them frequently as they cook down. Then turn off the pot. They thicken a little more as they cool. You can set the pot to the Keep Warm setting if you aren't serving them right away. Put a lid on them (don't set to Sealing if using the IP lid). *Quick Soak Method if you didn't soak your beans overnight: Pressure cook the beans in 4 cups of water, on High Pressure, for 2 minutes. Then turn the pressure cooker off and let the beans naturally release for 30 minutes. Continue with the recipe as directed. I am making this for a larger group of people and want to double. How wouls I adjust cook times? Thanks! If you have a larger pot, then doubling is fine. I would pre-cook the beans in the IP for about 30 minutes and then drain, and start the recipe. I’m looking at doubling the recipe. I just wanted to see how it worked for you Meagan? I’ve been looking at recipes online and this looks so good! I can’t wait to try it! I also making this for a larger group– do you think a 6quart IP can hold a double or triple recipe of this? I don’t think you can double it in the 6 qt, maybe 1/3 more? You may need to increase the cook time a bit, and leave some time to reduce the sauce after. Really good….thanks for the great recipe! That’s great, Tracey! Thank you for your review! Hi Margaret, I made this for a 6 qt pot. This is a great recipe, this is my fourth time making it and first time making a double batch. I have an 8qt so everything fit fine, fingers crossed. I tweaked the recipe a little. Left out the BBQ sauce, add a little extra ketchup, little more bacon and about 1/4 tsp of cayenne powder. Hi Clark! Your version sounds really good! I hope it worked as well in your 8 quart pot. Thank you for your review! This tasted great, but for some reason my beans were STILL at little hard after 4x the time on high pressure. Not sure what gives there, but I will definitely cook my beans prior to doing this recipe the next time I make it. Hi Carrie, I’ve had that happen, too, with other bean recipes. It turns out that old beans take way longer to cook than fresh dry beans. The thing is, it’s hard to tell how old beans are! Soaking them overnight helps, but if you can’t do that, or forget to, use my Quick Soak method in the Notes of the recipe card. I am glad you liked the flavor, and thank you for your review. The best of taste. I need to double. So: 2 lbs, beans, 14 cups water. Overnight. Then what’s wrong with about 60 minutes of IP time at high pressure (rather than precook?) and then 15 min cool-down. Also, I cut sugar and syrup in half, but use full molasses and double Black Pepper. Just wonderful result; not too sweet. I just got my first Instant Pot last week and this was the first recipe I tried. They came out amazing and were just delicious! I brought them to a party and they were a big hit and got lots of compliments! Thanks for the great recipe! Hi Karen! Yay! What a fun first IP recipe to make! I’m honored! Thank you for the great review, and here’s to many more successful IP meals! I am on my 4th extra 10 minutes trying to get the beans soft. Argh. Not sure what to do! Oh no! Are the beans old? Did you soak or do the “Quick Soak” first? Using. High pressure? Letting them naturally release?